I usually think of Paldo as one of the cheaper and lesser Korean brands. I got this pack from the Korean supermarket and it looks quite different from every other Paldo pack I've ever had. Notice that this one is different from the Paldo Kimchi Flavor that I already reviewed. 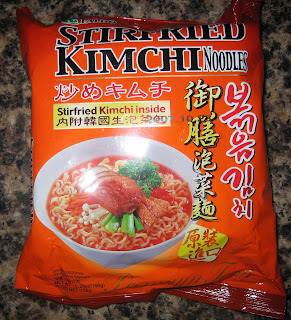 The package proudly indicates that stirfried kimchi is inside, which really intrigued me as I've never seen anything like that before. The kimchi came in a very large packet that was well sealed to prevent any possible leakage. Inside was a lot of liquid and the kimchi itself. 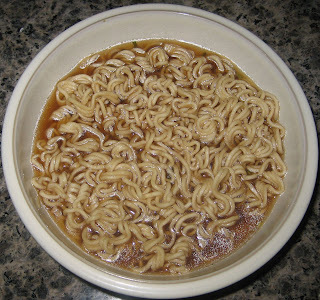 This was quite unusual because vegetables are almost always dehydrated in instant noodles. This saves on weight and also prolongs the shelf life. 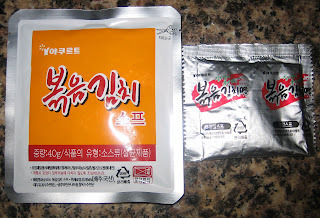 There were quite a few pieces of kimchi in the package; the kimchi pouch contained its own weight measurement and claimed to contain 40g of it. You can't really see all the kimchi in the picture because it tended to sink to the bottom. I think next time I try this one, the kimchi should be added right at the end so that it doesn't get buried during the stirring process. 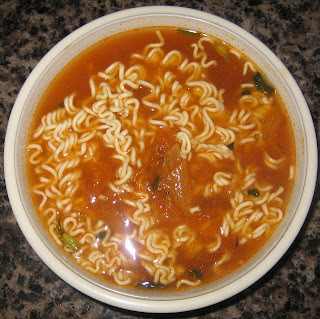 The Paldo noodles are typical Korean noodles. They are thick and chewy and provide a tasty contrast to the spicy soup. I thought that the flavor of the broth and especially the kimchi was a little bit too sour and bitter. The appeal of kimchi is that it is able to combine many different flavors, including spiciness, saltiness, savoriness, and a hint of sweetness. 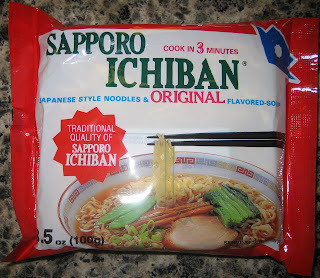 However, I felt that the flavor in these noodles was too sour and didn't really taste like kimchi. That was a shame, because the included kimchi was an interesting idea and I really wanted to like it.